Parent's Choice Award-winning songs for children ; ages 1-8 and their families. The songs are interactive, inventive twists to ten Mother Goose rhymes. Humpty, Hickory and a cast of familiar characters resolve their dilemmas with great imagination! 3. Pull Yourself Together, Humpty! These highly original songs, performed by Dennis Hysom, begin with favorite rhymes, and then spin-off into new adventures with familiar and new characters. The songs inspire children to build their writing, verbal, and dramatic skills. Wooleycat's cast of characters include a skateboarding Humpty, Hickory the Hang-gliding Mouse, astronaut Elizabeth Moo, and many more surprises. The upbeat songs explore self-reliance, problem-solving, world awareness, friendship, and other issues of interest to children. 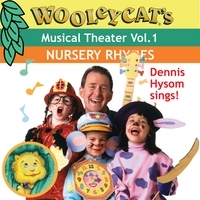 Wooleycat's Favorite Nursery Rhymes songs have won the Parents' Choice Gold, National Parenting Publications, and Telly awards, among others. Dennis Hysom has performed across the United States in schools and community concerts, at The White House, and has composed six children's albums, in addition to nine albums of instrumental music. Co-songwriter, Christine Walker, is an exhibiting artist and author of A Painter's Garden: Cultivating the Creative Life.